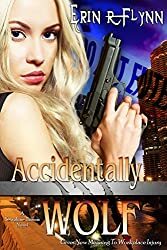 Accidentally Wolf is book one in the Seraphine Thomas series by Erin R Flynn. Sera is an FBI agent, or she was until she is clawed up on the job and turned into a werewolf. Now part of the MNSTR squad, she’s tasked with turning the paranormal branch of the FBI into a real division and not a joke. Of course, she has to deal with all the personal crap in her life too. Because nothing could just be easy. PS: If you don’t do open sexual stories or stories with multiple sexual relationships, don’t read this book. The story of the book is good. I feel like parts of it were forced do to writing style, but I was still held until the end. Sera is a very strong character, and well respected by her new team. If you want to try it out, there’s also a sequel. Or, you can read more on author Erin Flynn’s website.